SunnyKids is thrilled to be nominated as charity of choice again at this year’s Rotary Club of Caloundra Annual Charity Golf Day, to be held on Friday 17th March 2017 at Pelican Waters Golf Club. 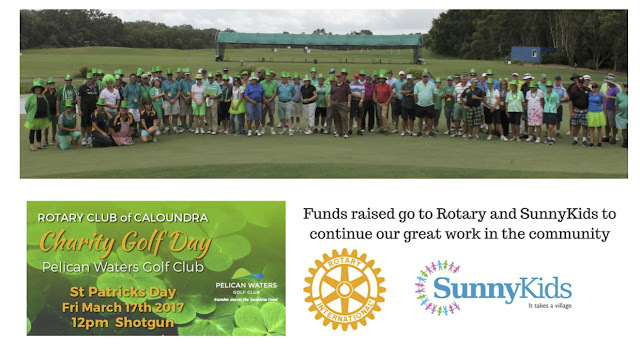 Last year’s event was a huge success with a sea of green hats to celebrate St Patricks Day fun and raise much needed funds for projects undertaken by both Rotary Club of Caloundra and SunnyKids in the community. SunnyKids Founder and CEO Chris Turner says, "Children are remarkably resilient. All we need to do for them is protect them, feed them and love them. Sadly too many kids on the Sunshine Coast miss out on one or more of these things. Every $500 raised at the golf day will allow SunnyKids to reach out to another vulnerable child. SunnyKids is privileged to work with Rotary Caloundra to change vulnerable children's lives." The event will use the 4 Ball Ambrose format with Shot Gun start at 12pm and will be followed by the presentation of trophies and prizes and sausage sizzle from about 5pm. The Annual Charity Golf Day is an ideal way to reward your staff, clients, friends or family and support a worthy cause at the same time. The Travel Agent of Caloundra, World Wide Cruise Centres, Club Car, Aussie Home Loans, Fox Taylor Mildwaters, Worrells, Ord Minnett Buderim, North Coast Body Corporate, Sebel Pelican Waters, Local Agent and Boland Cranes. There are a limited number of hole sponsor opportunities remaining which includes golf for 4 players, cart hire, lunch prior to tee off, signage and much more on the day. Donations of goods or services to be used as prizes are gratefully accepted and your contribution will be recognised on the day. Team entries are welcome, $340 for a team of 4 includes 18 holes of the magnificent Pelican Waters Golf Club, carts, build a burger lunch, sausage sizzle and all the on course fun and prizes. A day not to be missed! If you would like to register, enquiries can be made directly to the professional team at Pelican Waters Golf Club on 07 5437 5000. Please be advised that SunnyKids postal address has changed to 49 Price St, Nambour Qld 4560.